We all know birds can be a little bit vain. They're obsessed with mirrors and love to clean themselves before preening in front of everyone who will look. But as devoted as they are to their own appearance, at the end of the day there is only so much one bird can do. That's where the considerate bird owner can help out. Pet Mountain carries a wide variety of practical products designed to get your bird looking the best it ever has. 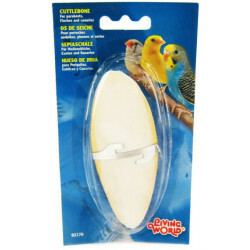 Bird Beak Conditioners are crucial for every bird's cage. Cuttlestones, mineral blocks and grinding stones all help to make sure that your bird's beak is worn down to keep it trim and sharp. Bird beaks grow continuously, which can eventually lead to serious problems. In the wild, interaction with their environment naturally keeps the beak trim. Providing a beak conditioner will do the same for your pet. 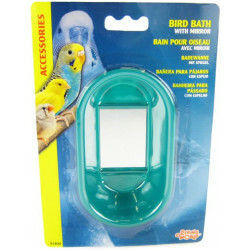 Bird baths attach easily to the inside of your bird's cage and provide a place for it to do what it loves best. Birds dunk themselves for several reasons, both to keep themselves clean and to find refreshment. An inside-the-cage bird bath is the perfect way to keep your bird clean at all times. When your bird simply looks like it could use a little sprucing up, Bird Bath Spray is a quick and easy way to make it happen. These sprays consist of healthy, natural oils and when used on a regular basis help to condition skin, soften feathers and brighten plumage. 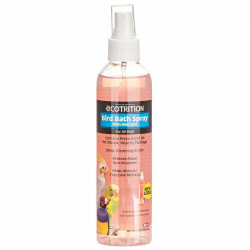 Over the long term bird bath sprays help relieve irritated skin and alleviate excessive molting.